Hire a personal RIB for 50 minutes and take to the waters to see the spectacular landmarks that London has to offer. The perfect experience for a group of people wanting an exciting day out! This is a unique opportunity to see the sights of London from your own privately chartered powerboat as you cruise along the river. You will have 50 minutes on the water with up 12 friends and family as you make your way along the river past famous landmarks, but this will not be a Venetian style gondola ride! These are very powerful RIB boats capable of 30+ Knots! 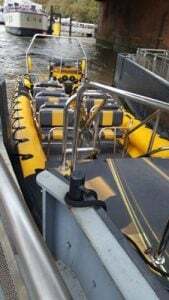 Once you have arrived and been welcomed onto the Pier, you'll be equipped with a life jacket and wet weather gear before stepping aboard the RIB powerboat. Your tour will begin at Embankment Pier and travel passed London’s popular landmarks, including the HMS Belfast, London Bridge and Shakespearer's Globe, before you pass under Tower Bridge and the excitement really starts! Feel the engines roar as your captain speeds down the river on an aquatic rollercoaster ride. Once you've reached the heart of the financial district, Canary Wharf, you'll turn round and head back to Embankment Pier, where the experience comes to an end. 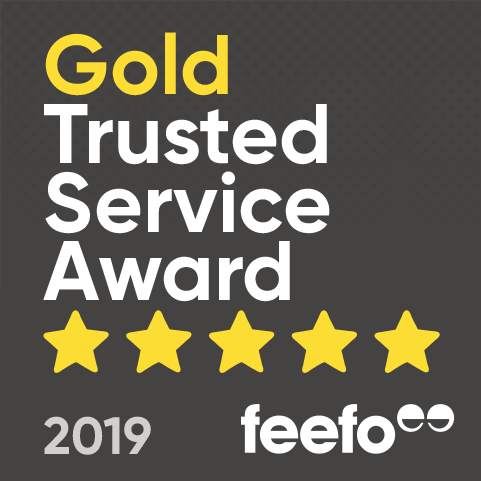 This is a fantastic experience for London tourists and locals alike, and makes a fun day out to share with the family! Due to safety reasons, people who are pregnant or people with existing back complaints cannot take part. Please be aware there are specific Terms and Conditions regarding the booking and cancellation of this activity, please enquire upon booking a date and time. This experience lasts approximately 50 minutes on the water. Please arrive 15 minutes prior to your excursion to collect life jackets and wet weather gear. 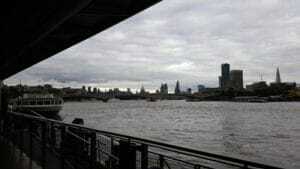 Participants: The Thames RIB Canary Wharf Experience - Charter is for 12 participants. This is not a weather dependent experience. 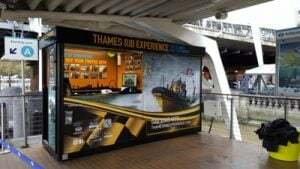 Last week we stopped by the Thames RIB Experience dock on Embankment Pier, where we got to meet some of the team and have a chat about the history of the company. 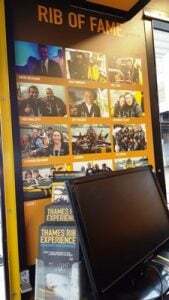 We met the lovely lady working in the kiosk named Fiona who answered some questions for us on behalf of the team at the Thames RIB Experience. Q1. 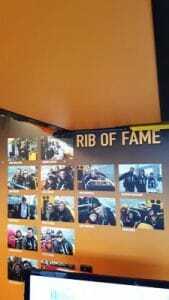 How did Thames RIB start/ how was it founded? Around 8 years ago by Dean and Charlotte who were in other professions at the time. Dean was an engineer and Charlotte was a mortgage adviser and then they came up with this brilliant idea. It was a struggle at first obviously, they had to start the business from their house. So, their home was their office. They then bought their first boat and originally only had a tiny little kiosk. You couldn’t get in it and it was very wind swept – the paper used to fly around everywhere! But the business took off from there and they bought a boat almost every year, developed the kiosk and opened another one in Tower Bridge. The coats now are a lot warmer for customers as well so everyone is super warm. Q2. What would you say sets you apart from other boat companies? Q3. Have you had any celebrities on board? There have been lots of celebrities aboard the Thames RIB, including David Beckham and Victoria, which was when he did the Olympic torch. We’ve also had David Walliams, Richard Hammond, Zane Lowe, Susan Boyle, Ant & Dec and many, many more! Q4. What would you say is the best part of working here? It’s the whole environment really and good rapport with the office. It’s mainly just myself in the winter, so I sometimes I have to occupy my time and talk to myself. But, I think it’s great all around, they really look after you and the idea that they have come up with makes it a really good environment to work in. It’s a small work place with few people so everyone really does get on well with each other. We all have nights out and staff parties which helps integrate each other and lets everyone get to know each other. I also love being on the boat, I think it’s absolutely glorious when I can sneak on! Q5. 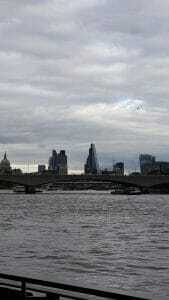 What’s it like working in central London? It can be stressful sometimes, with all the hustle and bustle and having to get the tube to work every morning. Other than that I think it’s great and I’m not really an office person anyway so I really enjoy working outside. It also gets a lot busier and manic in the summer. The other services on the pier have a lot of people loading so it gets a bit busy but we all help each other out. So this is really calm, in the summer it can be chaos. We do a few rescues sometimes, if we’re the nearest boat to the incident. Like the time the docks caught on fire we were the nearest boat. So they got an Innovation Award for that. Customers that have had to go on the rescue haves come back and said that was an adventure! Q6. If you could advise your customers to do one thing what would it be? I’d probably advise them to book the boat for New Years Eve! It is literally so amazing, I’ve done it for a few years now and sitting out on the Thames with the amazing buzzing atmosphere waiting for Big Ben to strike 12 is so great. You get some bubbly, chocolate and cakes on board and wait for the strikes. When the fireworks go off you’re just sat in the middle which is an amazing way to see all the lights and fireworks without standing between crowds of people! Q7. Any plans for the future/anything you would like to add? Just that Dean and Charlotte are really good and I really enjoy working for them! And apart from the occasional difficult customer, it’s a really nice environment to work in. Everyone is usually really happy and has a good time, it’s great to work here! And I just want to say thanks to Dean and Charlotte, they are always trying to think of new trips and expansion ideas. Watch out for Father Christmas on the boats as well! 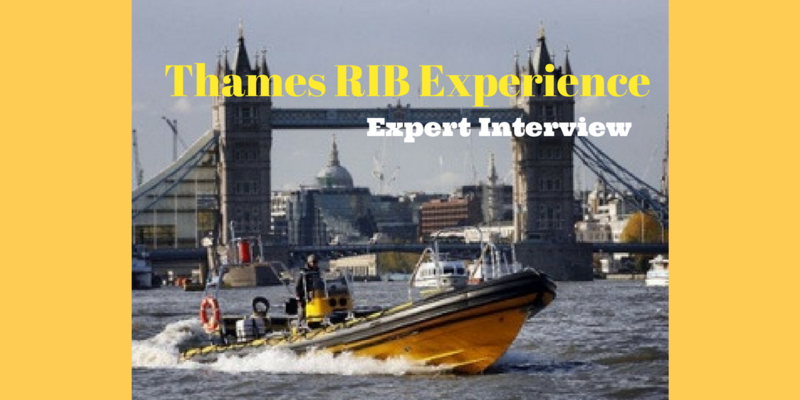 We would like to thank Fiona and Thames RIB Experience for taking the time to answer some questions and we hope you have enjoyed learning a little more about the company!